Last month we covered the current state of AI in customer service. This month we’re taking a speculative look into the customer service future to see what customer support should prepare for. The current market for AI in customer support is pretty new. Most of the companies offering a customer service tools are around a year old. That means we’re just starting to see what’s possible, and case studies are starting to come in. But if you’re like me, you’re already looking for the next big thing. To find out what’s next, and whether we’ll all lose our jobs to robots in the next decade, we gathered what experts in AI customer service think. Turns out, the AI customer service future is probably not as exciting and scary as you might think. The big question on everyone’s minds is how customer service jobs will be affected by AI. Good news! Most experts think customer service reps won’t be replaced by AI robots anytime soon. That’s because the types of questions customer service teams answer are too broad and complex to be answered by AI. Narrow Intelligence (or ANI): An AI that can do one thing well (better than a human), but is horrible at pretty much everything else. Artificial General Intelligence (or AGI): An AI that is as smart as a human, not only in regards to one specific task, but across the board. Artificial Superintelligence (or ASI): At this stage, an AI is much, much smarter than any human being and can do all sorts of crazy things. Right now, most AI is firmly stuck in the narrow intelligence category. One AI can beat us at chess and another can analyze data really well – but if you switched these tasks, they’d be literally useless. Every advance we’re making in AI is to move us towards general AI. This would mean AI machines could handle more than one task, handle uncertainty and learn new tasks much like a child can. We are not there yet and won’t be for many years. That last category – superintelligence – is very cool and scary and what we see in the movies. Really fun to read books about, but unless we have major breakthroughs in the field every decade, it’s unlikely to happen in our lifetime. So, back to your job. As McKinsey & Company explain below, there’s certain tasks that AI can definitely do. These are simple Tier 1 tasks like updating information or finding how-to articles. Repetitive, labor intensive tasks that humans generally don’t want to do anyway. The tasks AI can’t do are ones that take more consideration, creativity and ingenuity to do. No customer is going to take an apology from a robot when something goes wrong. The mainstream adoption of AI will mean that some jobs change. Fewer staff will be needed to respond to Tier 1 questions, because customers will be able to help themselves with the support of AI. Simple how-to questions or information requests will be handled instantly, without customers needing to talk to a human. That frees up frontline staff for tasks that require more human abilities like empathy and creativity. Customer-focused companies will reinvest these additional people resources into creating an even better customer experience. Think about all the things you’d like to do at your company for customers. What if you had unlimited time to accomplish them? AI for customer support means that Tier 1 agents can be reassigned to proactive, customer retention strategies, rather than dealing with common repetitive customer service issues. 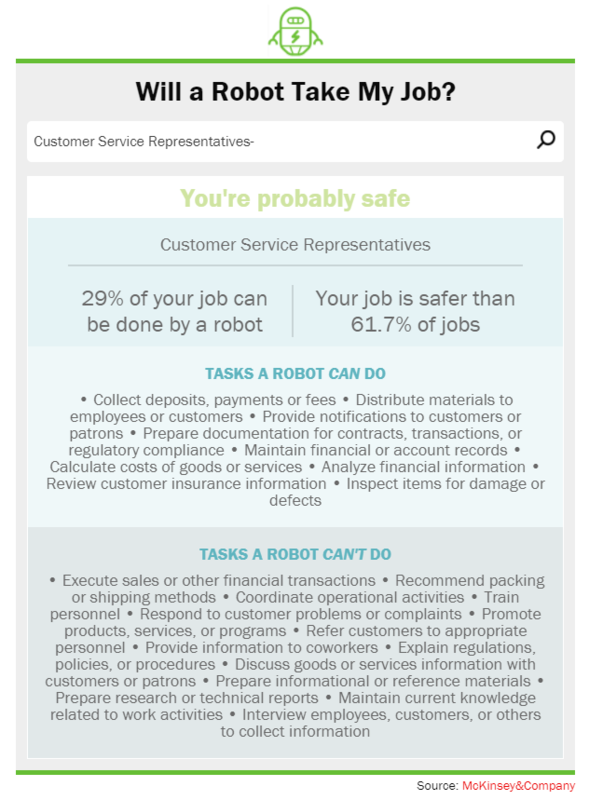 So if our jobs are safe (but changing), what does the future of AI hold for the customer support industry? We talked to three founders of AI technology companies who are creating innovative new ways for companies to embrace the power of AI in customer support. Here’s what they predict we’ll see in the next 3 to 5 years. “I see the future of AI in customer support changing from the very opaque systems we have right now (where for example a machine automatically sends the user an article but you don’t really why that article was chosen) to AI systems that are controllable and transparent. Currently, most AI is a black box system. We know what the input is, and what it outputs, but we often have very little idea as to why. For example, when Google trained it’s AI to recognize cats in pictures, they didn’t tell the AI to look for whiskers, pointed ears and fur. They showed the AI a million pictures of cats, and the AI drew its own conclusions of what a cat “looks like” to it. AI doesn’t recognize cats the same way humans do – and that can create problems when it comes to programming image recognition software. Chris believes that we’ll have more control over AI in the future. This means it will be more customizable, and transparent, and helpful! “In the next few years, customer service leaders will look at ways to integrate practical AI in their operations, as they see a rise in text-based volumes and growing expectations to reply instantly. The future of AI depends on creating a working relationship between humans and machines. Right now, many of our workflows are human optimized – meaning they rely on knowledge in our head, our relationships to other connections and meetings to transfer information. Working with AI means integrating the machines into our workflow. The most successful teams will be the most integrated. How cool would it be to have your customer conversations sorted by emotion? AI is getting much smarter at identifying human emotion through language and tonal cues. Hopefully we’ll see this technology continue to improve and be integrated into customer support systems. None of the experts we’ve asked suggested that AI is heading towards Hollywood levels in the next 5 years. In fact, you could almost call their predictions a bit boring. There’s no super-intelligent AI assistants, no robots taking over the world. All we have to look forward to is a bit more flexibility and insight into what our customers are thinking. How do I win the AI in customer support game? It might feel overwhelming to be at the forefront of the next big change in customer service future. 15 years ago we were learning how to deal with email and live chat. 5 years ago, everything changed again with social customer care. Artificial Intelligence is the new era and customer service future. Change Management – those who can adapt, will win. Change is the only constant in business, and people who can keep up will be better positioned to take advantage of new opportunities. Those who can’t will be left behind. Process Management – AI needs processes to follow. Integrations depend on clear and defined processes to be successful. Many of the opportunities created in the era of AI will involve reading and updating processes to make the customer experience better. Always be Learning – employees who continue improving have always been the most successful. As we get older, it gets easier to say “oh, I don’t understand that” and move along. Instead, assume you can learn anything, and dig in. The more you know, the more successful you will be.